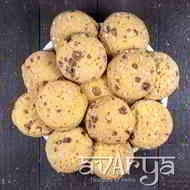 Our Butter Scotch Cookies, are a classic combination of buttery and delicious. These baked delights for your sweet tooth, will keep your family and guests coming back for more. Take a glass of milk and dunk them to enjoy the tasteful experience. These indulgent cookies will be the star of your next party! Butterscotch Cookies	BK-CO-1346 Our Butter Scotch Cookies, are a classic combination of buttery and delicious. These baked delights for your sweet tooth, will keep your family and guests coming back for more. Take a glass of milk and dunk them to enjoy the tasteful experience. These indulgent cookies will be the star of your next party! Flour Edible Veg Oil, Sugar, Coconut, Leaving Agents, Contains Food Colour, &Added Flavour. The shelf life of Butterscotch Cookies is 60 days.